17/04/2018 Springs are used in the most various of fields. Don´t miss out Lesjöfors springs displaying the latest in trainer trends from the iconic sporting brand Nike in the Oxford Street store in London. 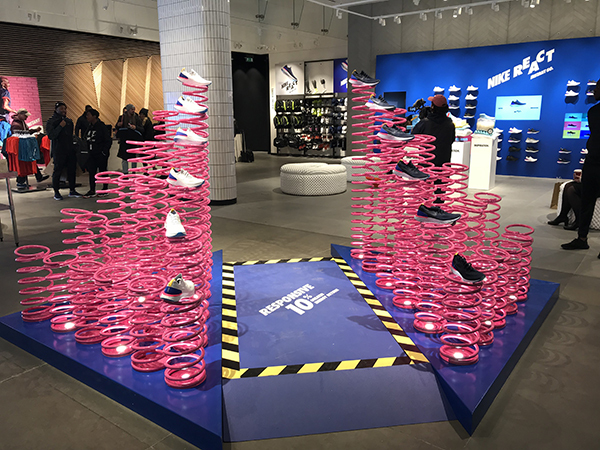 Simulating ‘bounce’ and a spring in your step, the compression spring aesthetic was the natural choice for the Nike creative team at the prestigious sports store in London. A bespoke spring solution was produced by the Lesjöfors company, European Springs & Pressings in Cornwall, in shocking pink!